Sad we never got a photo to capture the beauty that is Lark... she truly is living art in every sense of the word! Rowan.... What to say about this little child who redefines "force of nature"? She took my breath away when she was born. Balanced and elegant. Feisty and opinionated she was born beautiful and knows it. I told Tim when she was three weeks old that she had Kitten of the Year written all over her... She is just that special. Unfortnately Rowan does nothing Rowan does not want to do.... and she did not think going to live with Tim was a good idea. Her show career was short-lived and she happily made her way back to me.... an only child who has no fear... she thinks the world revolves around her gorgeous little self and in this little corner? Well, it does. Jade is a Lark Daughter who brings me to tears with her beauty and grace. She is that one-in-a-million type of cat that is almost too good to be true... She reminds me of her great grandmother Pounce and for that I am eternally grateful... 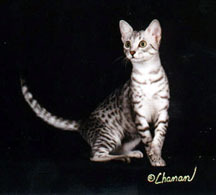 I have bred for 20+ years trying to recreate the magic that was Pounce... Sunny came close, and now I have Jade (thank you to Tim for realizing how much my heart needed her and giving her back to me at the end of the season). 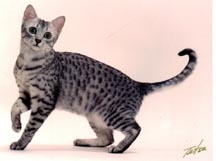 She became the highest ranked National winner in Championship for the breed ever in the same year that I lost my muse, my bewitching Pounce... If not for her, Pounce's loss would have spelled the end of my breeding career, but cats like her are truly extra-ordinary and they inspire even the most devastated of us. Beauty like hers is a gift that can heal a broken heart and she did just that. Some people can only dream of a cat like her... I am blessed to share my life with her. She is the most forgiving cat I have ever met... A joy to show, a wonder on the judging table and equally as charming at home. 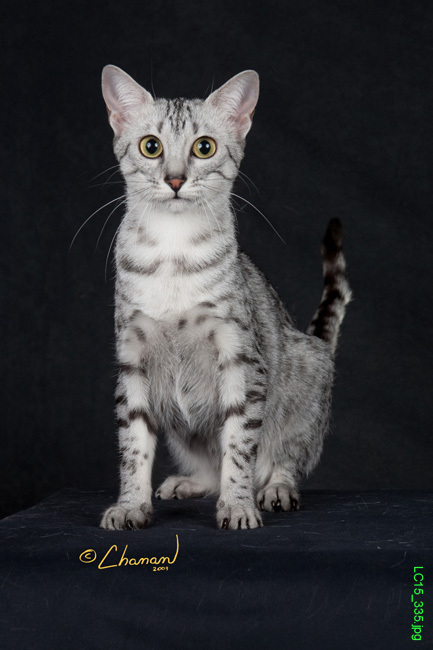 Long-legged and graceful with huge green eyes and phenomenal ears. 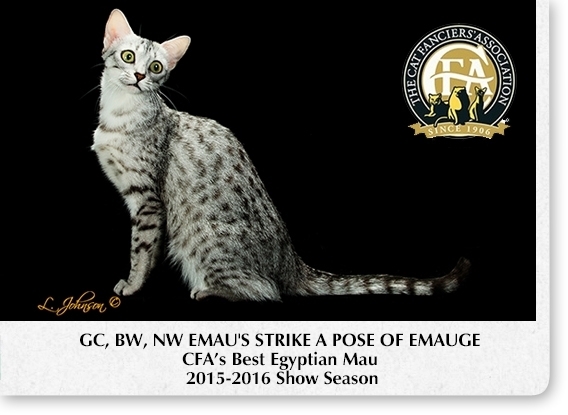 She ended up the first Egyptian Mau to earn the title of Best Cat in the Southern Region, the first Egyptian Mau to break the top ten Nationally as ninth Best Cat in CFA. 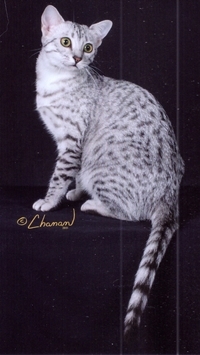 Khepri - Our first love and the 5th ever Egyptian Mau Distinguished Merit cat. Kyrie - Our elegant and frightfully intelligent superstar! Pounce - The love of my life. 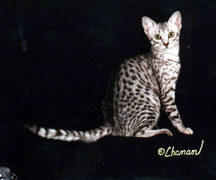 Cheetah - Our sweet "duh" girl and the 6th ever Egyptian Mau Distinguished Merit cat She retired to Sunny Florida with Spirit! Pyramid - Pyramid passed her exquisite boning and sweet personality on to her babies! Porsche - Our German Beauty! Future - Spirit's little sister, Future was 38th Best cat in the country 1999/2000 season. Karma - she's smart, sassy and very spotty! Hope(1) - Sweet, loving, happy... Perfect body coat and pattern...Who could ask for anything more? Hope AKA Sylvie, now lives in Germany! Nikita - Nikita has one of "those" bodies - you know the kind the ones you love to hate! She is 3rd generation Duh. Kali - Our lovely gift from Maullenium - Kali now lives with Brenda in Richmond and rules the household!